Buena Vista Town Hall is located at 210 East Main Street, Buena Vista, CO 81211; phone: 719-395-8643. Photo: Josiah Morris Bonney House, ca. 1883, 408 Princeton Avenue, Buena Vista, Colorado. Listed on the National Register of Historic Places in 1994. Photographed by User:Jeffrey Beall (own work), 2010, [cc-by-3.0 (creativecommons.org/licenses/by/3.0)], via Wikimedia Commons, accessed April, 2013. Founded by silver prospectors, Buena Vista was incorporated in 1879. The following year, an election changed the Chaffee County seat from Granite to Buena Vista. The town of Granite was reluctant to give up this status, which forced a group of Buena Vista citizens to charter a locomotive with a flat car and remove the county records in the middle of the night. (Buena Vista remained the county seat until 1928, when it was moved to Salida.) The town was at the center of productive mining country. That same year (1880) the Denver, South Park and Pacific Railroad arrived in town. The arrival of a railroad meant easier accessibility to lumber and decorative detailing. This is evident in an 1880s William H. Jackson photograph of the town's railroad yard showing the Buena Vista Land Company office building with ornate vergeboard. (Unfortunately the building no longer exists.) The town was the terminus of the railroad until the extension to Leadville was completed. Passengers bound for the mineral-rich Leadville area were required to detrain and take a stage coach to their final destination. In 1881 a smelter and ore sampling works was built and the following year, construction on the courthouse and jail began. 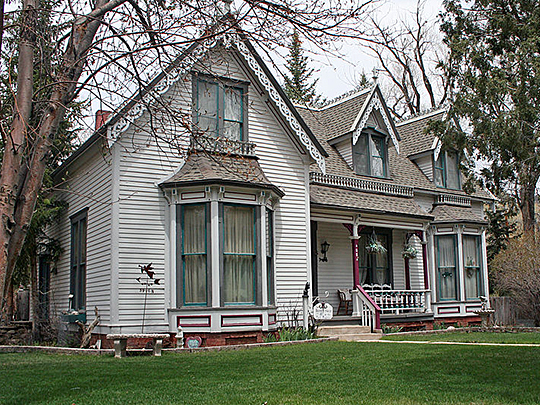 The Bonney House was built in 1883 for banker Josiah Morris Bonney. He established the First National Bank of Buena Vista in 1900 and was its president. In 1897, he married Eugenia Brown. Eugenia was one of four daughters of Mr. Brown, a partner in a local mercantile operation. The Bonneys were described as a "handsome, charming and elegant couple, unquestionably the social arbiters of Buena Vista," who "entertained beautifully in their handsome large home by the river." Randal W. And Andra L. Hendrie, J. M. Bonney House, Buena Vista, Chaffee County, Colorado, nomination document, 1994, National Park Service, National Register of Historic Places, Washington, D.C.